Easily and instantly dissolvable in any liquid or semi liquid. Easy to measure., Not sticky, no need for scrapping or melting, easy to use. Carries all nutrition of the sweet sap of palmyra. Powdered palm sugar retains high nutrional values. It has Thiamine (Vit-B), Riboflavin (Vit-B), Nicotinic Acid (Antipallagara Vitamin), Ascorbic Acid (Vit-C) and minerals like calcium, phospherous and iron. 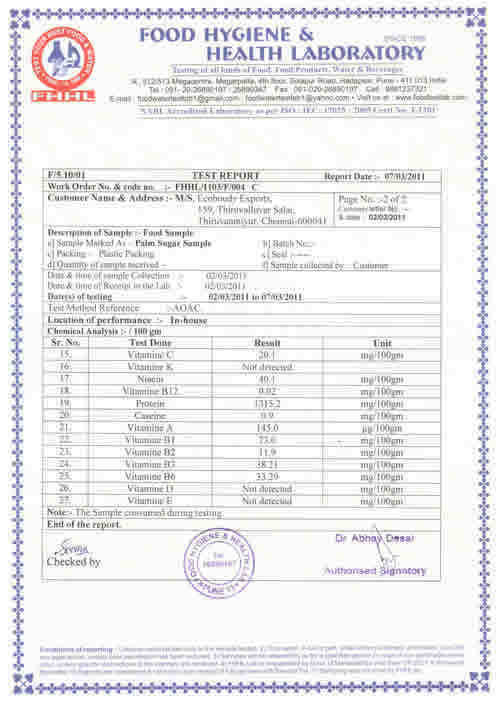 Also to note is that the Palmyra Palm Sugar is the only known plant generated natural source of Vitamin B12 & palm sugar retains this as shown in this professional lab report. 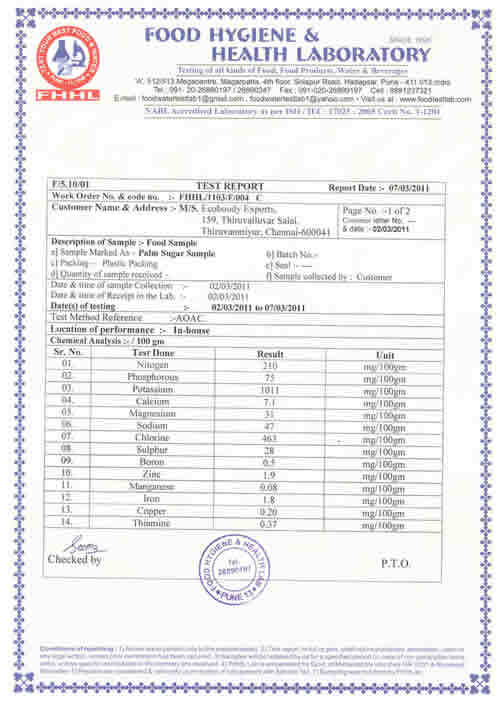 Palm sugar powder is certified organic. It is made from organically grown palm trees. Easy to store. Doesn't go bad even stored for years together when stored in air tight containers. Does not need refrigeration. Because of it's unique taste, it acts as more than as just a sweetener. It adds flavor to the recipe. Some Indian, Srilankan and thai recipes specifically require palm sugar. It does not contain any harmful substances or coloring agents. No chemicals are used during powdering nor is any bleaching involved as in the case of white sugar. It is traditionally believed to have medicinal qualities. Regular use will prevent calcium deficiency and anemia. Traditional Indian medicine uses palm sugar as a medicinal product. It carries lesser calorie than white sugar and many other sweeteners. How is Palm Sugar suited for growing children and babies? Vitamins A, B1, B2, B3, B6, B12 (yes, palmyra palm sugar is the only known plant generated natural source of Vitamin B12) and C present in the Palm Sugar makes it the richest natural sweetener available in powder form. The nutritional value is more than Demerara sugar! These vitamins are not artificially added or enriched or fortified but received as a gift from mother nature. Palm sugar is not bleached in any way. Palm sugar is organically grown. No chemical fertilisers or pesticides is used in the Palm groves from which Palm sugar is extracted.The land has been maintained as organic for many generations. And now Palm Sugar is Certified Organic! 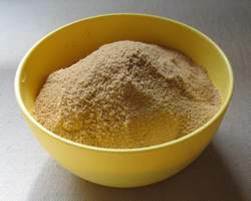 Palm sugar powder is more nutritional than crystal Palm Sugar and hygienic than most of the Palm Gur available in the market. It is also free from flocculent or surfactants or viscosity modifiers used in other sweeteners or processed foods. It is free from any chemical additives in the powdering process. No color is added to modify its appearance. Since it is available in a dry powder form there is no need for preservatives in this. Palm Sugar is storable for about an year without any change in the flavour or nutrition if kept airtight. Other Palm sugars in hard cake or liquid form is susceptible to fungus which makes it dangerous for the kids. Palm sugar's glycemic index is 35, just over 1/3 of the glycemic index of cane sugar (GI 93). This means that if a person sits down to a tablespoon of palm sugar and a tablespoon of white cane sugar, the cane sugar will raise the person's blood glucose levels to a certain degree, whereas the palm sugar will only raise the glucose levels to about 37% of the cane sugar level. It also has some natural protein and fat. It's inherent chocolate like flavour make this a kids favorite. It doesn't just sweetens the dish but adds a unique exotic flavour to it. Since it is instantly dissolvable, its easy for the mothers' to use it in any drink they may go for. It greatly enhances the taste of plain milk, Soy milk, Coconut milk, Porridge or any health drink. Replacing cane sugar for Palm Sugar in all the sweet recipes or desserts done for the kids greatly enhances the nutrition value of the food served. offers Palm Sugar in Sachets also which will be helpful for the moms to carry it any where to mix it in milk/beverages whenever needed. Children could simply have it as such! It feels like having sheer chocolate! It is good for the baby to get used to a natural taste instead of an artificial or made up taste. Palm Sugar has been the natural sweetener in India and in many parts of Asia for many centuries before cane sugar was introduced by the British. Yes, we can now understand how our forefathers were healthy and intelligent without any nutritional supplement, pill or tonic! 6 Contains Low Glycemic Index. The Glycemic index is only 40. Replacing cane sugar with palm sugar is a big step for diebetics, heart patients, cancer patients and obese people. Normal people by replacing Palm Sugar with white sugar, the risk of diebeties, obesity and heart ailments are reduced. Contains High Glycemic Index. The GI of cane sugar is more than 92. This makes it harmful for Diebetic patients, heart patients, cancer patients and Obese people. 14 Palm sugar consumption brings in equality in economy as this supports unprevileged palm tree tappers life. Since palm sugar comes with minimal processing, the proportion of money spent on processing is less and proportion paid to the farmers is more Proportion of money which goes to palm tree tappers out of every sale price paid by the customer is high than that of cane sugar. Large share of the money paid by the end customer goes to big sugar mill owners and to meet out huge processing expenditure.